The M30 CytoDeath™ antibody distinguishes between necrotic and apoptotic cells with several disease entities. Therefore it's a unique tool in working out apoptosis very early or in advanced stages. ​​​​​​​Apoptosis induced by either death-inducing receptors or other stimuli leads to activation of specific caspases. Subsequently, apoptotic cells are eliminated by an intrinsic suicide program, resulting in DNA fragmentation, nuclear condensation, cytoskeletal reorganization, plasma membrane blebbing and loss of cell adhesion. Keratin 18 (K18) is a type I intermediate filament protein and the major component of single-layer and glandular epithelial cells. It is expressed in most types of carcinomas such as lung, liver, prostate, breast and colon, whereas K18 is absent in lymphoid and neuronal cells and tissues. During apoptosis after initiation of effector caspases 3, 6, 7 and 9, K18 is cleaved into proteolytic fragments liberating neo-epitopes (NE) at the cleavage sites (ccK18, K18F). K18 is cleaved by capases, liberating a neo-epitope (M30) that is specifically recognized by the M30 CytoDEATHTM monoclonal antibody. Specific proteolytic cleavage of K18 is an event taking place before disruption of membrane asymmetry and DNA strand breaks occur. Numerous studies confirm that M30 CytoDEATHTM antibody detects only apoptotic but not viable or necrotic cells. 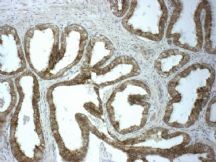 Application of M30 CytoDEATHTM antibody in immunohistochemistry (tested for FFPE and frozen sections) is apoptosis specific and whos superior reliability compared to TUNEL in conditions when DNA double-strand breaks occur independent of apoptosis and active caspase staining in inflammatory tissues or sites of regeneration. The capacity of M30 CytoDEATHTM antibody in flow cytomery and immuno-histochemistry studies to distinguish between necrotic and apoptotic epithelial cells has been verified in several disease entities. Consequently, M30 CytoDEATHTM antibody represents a unique tool for easy and reliable determination of apoptosis from very early until well advanced stages in single cells and tissue sections of epithelial origin. M30 Apoptosense® ELISA (ccK18, K18F, K18Asp396NE-M30) M30 Apoptosense® is an enzyme-linked immunosorbent assay (ELISA) for the quantitative detection of caspase-cleaved Keratin-18 (ccK18, K18F, K18Asp396-NE: M30 neo-epitope) levels in cytosolic cell extracts, cell culture supernatants, human serum or plasma or other body fluids. The M30 CytoDeath™ ELISA is a unique product specifically for cell culture applications. This is a powerful drug screening tool and is useful for in vitro characterisation of apoptosis-inducing drugs. It also offer the ability to quantify apoptosis in multicellular spheroids and organ culture systems. The keratins are conserved phylogenetically and are closely related. Keratins 1-8 constitute the type II group, while keratins 9-20 constitute the type I group. Keratins provide useful markers for epithelial malignancies, distinctly reflecting ongoing cellular turnover. Certain keratins are substrates for lethal caspase activation and therefore define protein fragments during cell death.